Although sewage treatment could be a trivial job, bacteria are always gladly doing it. Sewage plants are dependent on bacteria to eliminate environmental toxins from waste to ensure that the processed water can be securely discharged into rivers and oceans. At present, Princeton scientists have discovered a bacterium in a New Jersey swamp, which might provide a more effective technique for the treatment of toxins found in fertilizer runoff, sewage, and other types of water pollution. The bacterium, named Acidimicrobiaceae bacterium A6, has the potential to break down ammonium, a pollutant detected in fertilizer runoff and sewage. Even more interesting is the fact that A6 has the ability to carry out this chemical conversion without oxygen, which could be useful for offering alternatives to high-cost oxygen-reliant techniques used at present in sewage treatment and other processes. A great deal of energy is used by machinery that mixes air into wastewater to provide oxygen for breaking down ammonium. A6 carries out this same reaction anaerobically and might present a more efficient method for treating ammonium and a way to treat other environmental pollutants found in oxygen-poor areas, such as underground aquifers. Jaffe and his colleague Shan Huang, who is an associate research scholar in civil and environmental engineering at Princeton, have described the discovery of A6 and its distinctive capabilities in the PLOS One journal on April 11, 2018. Majority of the sewer plants discharging into rivers or oceans have been already using bacteria to eliminate ammonium from waste; however, to do this, lots of air has to be churned into the sludge to feed oxygen to the bacteria. As part of a chemical reaction, the bacteria use up the oxygen and ammonium is converted into nitrite, and subsequently, other bacteria transform the nitrite into harmless nitrogen gas. The elimination of ammonium is vital in preventing the depletion of oxygen in streams and to avoid eutrophication, that is, the growth of enormous amounts of algae and other plants sparked by nitrogen compounds found in agricultural runoff and sewage. Feammox, an alternative chemical process for the disintegration of ammonium, takes place in iron-rich, acidic, wetland soils and environments and has been discovered to occur in riparian wetland soils in New Jersey, in wetland soils in South Carolina, in tropical rainforest soils in Puerto Rico, and at several wetland and forested locations in Southern China. However, there was no clear understanding of what triggered the Feammox reaction. 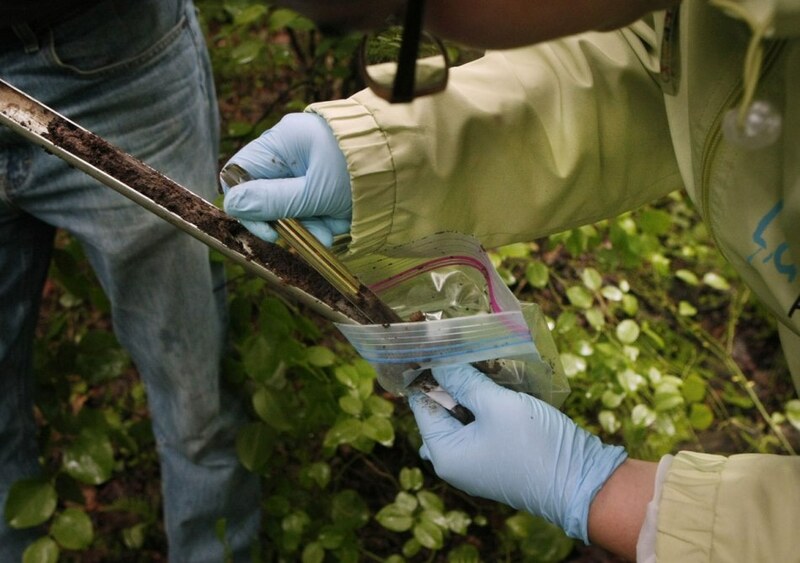 In 2015, while analyzing samples collected from the Assunpink wetland near Trenton, New Jersey, Jaffe and Huang predicted that the process could be triggered by a single bacterium. Investigations by Jaffe and his team at that time revealed that the Feammox reaction occurred in the swamp samples only in the presence of a class of bacteria called Actinobacteria. Of these bacteria, the scientists recognized a particular species of bacterium and named it Acidimicrobiaceae bacterium A6. They suspected that this bacterium had a vital role in the Feammox reaction. They predicted that A6 was behind the conversion of ammonium into nitrite and that common bacteria were taking care of the conversion of nitrite into nitrogen gas. However, isolation of the bacterium and explicit confirmation of its role needed many years of meticulous studies. In their innovative study, the Princeton researchers mixed soil samples gathered from the New Jersey wetland with water and a material that comprised of ammonium iron and oxide and then left the mixture to incubate in vials for almost a year. Mixing of the soil samples and the metal medium in the vials was performed in an oxygen-free chamber, and the vials were sealed airtight to emulate the anaerobic conditions of the wetland soil where the bacteria originated. During the course of the year, the researchers removed a small sample from each vial about every two weeks to check for degradation of the ammonium and iron oxide. Upon finding out a sample in which this reaction occurred, they adopted genetic sequencing to recognize the bacterial species present—and certainly found that A6 was triggering the Feammox reaction. The Princeton researchers are investigating the ways to develop a reactor in which A6 can be used to process ammonium at industrial levels. One difficulty in achieving is the excess consumption of iron by the bacteria to perform the process, which would render it highly expensive as a technique that would be an alternative for aeration. To overcome this difficulty, the scientists are conducting experiments by applying a small electrical potential between two electrodes introduced into the reactor’s liquid in a device known as a “microbial electrolysis cell.” The electrodes can then mimic the role of iron in the Feammox reaction. The Princeton researchers have been collaborating with the Chinese environmental ministry to create a prototype reactor to minimize the amount of heavy metals and ammonium in wastewater. They have been investigating whether the technology could assist in resisting eutrophication, where huge amounts of nutrients in runoff destroy lakes, rivers, and coastlines. The scientists also discovered that when ammonium was oxidized, the A6 bacterium also had the ability to simultaneously eliminate tetrachloroethylene and trichloroethylene, two hard-to-treat pollutants usually found at polluted sites. The bacterium could also transfer electrons to other compounds (for example, copper and uranium) other than iron. Uranium was transformed into a form that was insoluble in water. The National Science Foundation and Princeton’s Project X Fund, a fund to support unconventional research, supported the project. “Funding by Project X, which is meant to fund high risk projects, made this work possible and has allowed our laboratory to pursue new and exciting research directions and now more traditional funding mechanisms,” stated Jaffe.